If you're really looking for THE best seat in the house, try a recliner! This Mannix Recliner is a great choice that blends style and comfort. In a versatile espresso color, this recliner can easily slip into any man cave, family room, or great room. For a sleek set that offers a great seat for everyone in the family, opt for a reclining set like the Jamestown. Available in a reclining sofa, reclining loveseat, and single recliner, this set will quickly fill your large basement. Just add a TV and refreshments! Available to customize in your choice of configuration and leather, the Forest Hill Sectional is a great option. 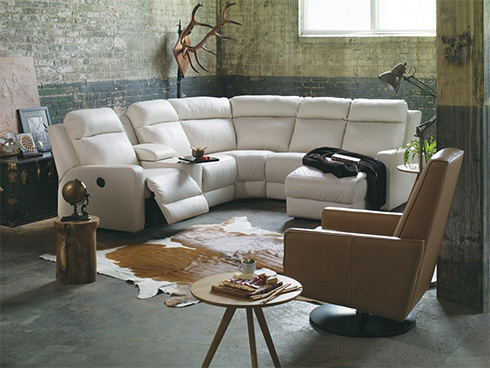 Providing the most seats in the smallest square footage is what sectionals do best and this one has a great style too! For a limited time, until February 2nd 2015, receive a free power upgrade on any Palliser Motion Sofa, Loveseat, Sectional or Recliner. * Limited time offer, see store for details. To view these and other options to outfit your home for the year's biggest football game, visit Belfort Furniture's showrooms in Dulles, Virginia. Filled with hundreds of room settings, you'll find some great choices for reclining and motion furniture to fill your basement or family room!